Note: you may use the 38 Special die set to reload for the 357 Mag. You would have to back out the Powder Thru Expander Die, and the Bullet Seating and Crimping Die about 2 turns to compensate for the longer 357 case. Can be used to load the 10mm Auto. Back out the bullet seating die and powder through expanding die 1 3/4 turns. 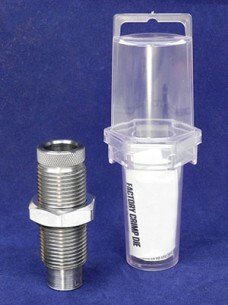 10mm Load Data is found in “Modern Reloading” or available for purchase here. 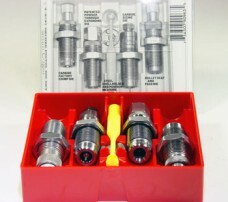 Lee 45 Colt Pistol 3-Die Set includes Carbide Full Length Sizing Die, Bullet Seating Die, Powder Thru Expanding Die, Universal Shell Holder, Powder Dipper and Instructions/Load Data. 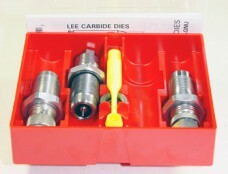 Lee 38 SPL Pistol 4-Die Set. Includes Carbide Full Length Die, Bullet Seating Die, Powder Thru Expanding Die, Universal Shell Holder, Powder Dipper and Instructions/Load Data. Lee 40 S&W Pistol 4-Die Set. Includes Carbide Full Length Die, Bullet Seating Die, Powder Thru Expanding Die, Carbide Factory Crimp Die, Universal Shell Holder, Powder Dipper and Instructions/Load Data. Lee 45 ACP Pistol 4-Die Set. Includes Carbide Full Length Die, Bullet Seating Die, Powder Thru Expanding Die, Universal Shell Holder, Powder Dipper and Instructions/Load Data. Lee 45 Colt Pistol 4-Die Set. Includes Carbide Full Length Die, Bullet Seating Die, Powder Thru Expanding Die, Universal Shell Holder, Powder Dipper and Instructions/Load Data. Lee 9mm Luger Pistol 4-Die Set. Includes Carbide Full Length Die, Bullet Seating Die, Powder Thru Expanding Die, Carbide Factory Crimp Die, Universal Shell Holder, Powder Dipper and Instructions/Load Data. Lee Auto Disk Riser raises the Auto Disk powder measure higher above the mounting location on the Turret Press to provide clearance for use of the Safety Prime. 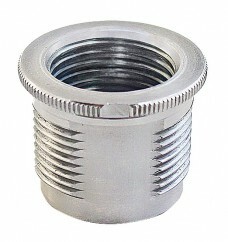 Lee 223 Factory Crimp Die crimps the bullet in place more firmly than any other tool. Tests demonstrate that even bullets which have no crimp groove will shoot more accurately. A firm crimp improves accuracy because pressure must build to a higher level before the bullet begins to move. This higher start pressure insures a more uniform pressure curve and less velocity variation. 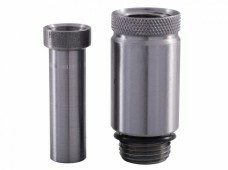 Lee 38 Special/357 Magnum/357 MAX Carbide Factory Crimp Die sizes the cartridge while being crimped so every round will positively chamber freely with factory like dependability The adjusting screw quickly and easily sets the desired amount of crimp. Trim Length is not critical so this extra operation takes less time than it would if cases were trimmed and chamfered. A firm crimp is essential for dependable and accurate ammunition, as it eliminates the problems of poor ignition of slow burning magnum powders. Lee 40 S&W/10MM Carbide Factory Crimp Die sizes the cartridge while being crimped so every round will positively chamber freely with factory like dependability The adjusting screw quickly and easily sets the desired amount of crimp. Trim Length is not critical so this extra operation takes less time than it would if cases were trimmed and chamfered. A firm crimp is essential for dependable and accurate ammunition, as it eliminates the problems of poor ignition of slow burning magnum powders.